A professional Mac BD/DVD Ripper - rip/convert/compress Blu-ray and DVD movies for watching on iPad, ATV, iPhone, etc. When playing DVD disc on Mac, you may have a look at the disc folder like external drive. There are VIDEO_TS folder and AUDIO_TS folder, and several .ifo files in the VIDEO_TS folder. The IFO files include navigation info of the DVD movies like chapters and titles, which help media players to play the requested content like VOB in the folder. Motorola Droid X, as the latest Verizon Android phone, includes 4.3-inch multi-touch screen, and plays videos with H.263, H.264, MPEG-4 as video codec and AAC, MP3, WAV, eAAC+, WMA v10, MIDI, AAC+ as audio codec. 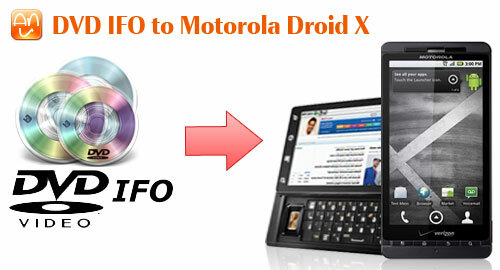 However, Motorola Droid X does not support directly import DVD IFO to play movies. Aunsoft Blu-ray Ripper for Mac is the recommended Mac DVD IFO to Droid X converter for you to convert DVD IFO to MP4, and transfer movies to Motorola Droid X. The Mac DVD IFO to Droid X converter also enables you to load DVD IFO from DVD-Video file structure folder on computer hard drive, and rip DVD movies with subtitles. Follow the steps below, and you can play most of your DVD movies on Android phones like Motorola Droid X, HTC EVO 4G, Google Nexus One. Step 1. Load DVD IFO to Aunsoft Blu-ray Ripper for Mac. Insert DVD disc to the built-in DVD-Rom, run Aunsoft Blu-ray Ripper for Mac as the best DVD IFO to Droid X converter on Mac Leopard and Snow Leopard. Then Click the "IFO/ISO" button and choose the DVD from DEVICE, open the VIDEO_TS folder to find IFO files. Here I choose VIDEO_TS.IFO for conversion. Step 2. Choose Motorola Droid X MP4 format. 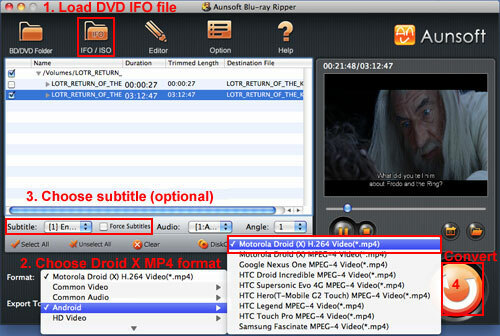 Click the "Format" option and choose Android > Motorola Droid (X) H.264 Video(*.mp4), and the DVD IFO to Droid X converter will transcode DVD movie to MP4 for playback on Droid X.
Click the "Subtitle" option to choose the preferred subtitle language for Droid X MP4 video. Please note that there is only subtitle for main movie on most DVD discs. Step 4. Convert DVD IFO to MP4 for Droid X.
Click the convert button under the preview window, and the conversion from DVD IFO to Droid X MP4 starts immediately. Wait for a while, and then you can transfer Converted DVD movies to Motorola Droid X and enjoy videos with subtitles. 1. To choose the right IFO for conversion, you may need to load each IFO several times. Generally speaking, the VIDEO_TS.IFO is for the entire disc, the VTS_01_0.IFO for the main movie and other IFO files as copyright notice, extras and so on. You can also load the entire DVD disc or DVD folder by clicking the "BD/DVD Folder" button. 2. If you have other videos in .mkv, .mts, .avi, .mov formats, you can use Aunsoft Blu-ray Video Converter Ultimate as the Mac video converter for Droid X.
Aunsoft Droid X Column, Put/play videos on Motorola Droid X, Rip DVD ISO Image to Droid X MP4, Transfer DVD to Droid X for Playback, Convert AVI files to Motorola Droid X, Convert MKV files to Motorola Droid X, Convert VOB Files to Motorola Droid X, Convert WMV/WMV HD to Droid X, Mount Videos to Motorola Droid X, Convert Blu-ray to Motorola Droid X, Convert M2TS to Motorola Droid X, Convert TiVo to Motorola Droid X, Stream Droid X Videos to HDTV via DLNA, Play Droid X Gallery Video on TV via HDMI. This is the only program I have ever tried to rip Blu-ray disks and the fact that it is a one step process is very good. And I really enjoy the function which named as DiskCopy. I'm pleased with the product so far. I want to convert my 100 blu-ray library into a video jukebox through a WDTV box. I've converted about 50 blu-rays so far and I'm pleased with how it worked. It is very very nice and dead easy to change file formats from m2ts to what mac can read, i..e. dv, mov, etc well worth what I paid for it.